Wood Badge is a premier adult leadership-training course for the Boy Scouts of America. Wood Badge was originally presented by the founder of Scouting, Lord Baden Powell, in 1919 as a means of strengthening the Scouting movement throughout the world. The Wood Badge of today teaches contemporary leadership and team development skills in the outdoor setting of Scouting. Aside from teaching new skills, the experience also strengthens Scouting in our units, our districts, and our councils. The Course consists of two parts: PRACTICAL TRAINING and APPLICATION. During the (2) course weekends the Practical leadership experiences are gained in a camp setting where members participate in hands on activities with other members of their Wood Badge Patrol. 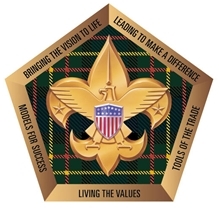 The Application, known as a Wood Badge “ticket”, represents each participant’s commitment to complete a set of personal goals relating to their Scouting position. They put to use the skills learned during the (2) weekends. Participants will have (18) months after the course to complete their Wood Badge “ticket”. Complete details of the ticket will be supplied during the course and a ticket counselor will be assigned to each participant to give guidance along the way. Who Can Attend Wood Badge? Be registered members of the Boy Scouts of America. a. Youth older than 18 may attend as long as the appropriate Youth Protection guidelines are followed. They do NOT need to be registered in an adult leadership role. The following article is from the March-April 2014 issue of Scouting magazine: Why Wood Badge? Course Hosted in conjunction between the Pennsylvania Dutch Council and Chester County Council. Join your fellow Wood Badgers for food and fellowship Wednesday, January 30, 2019 at Yoder’s Family Restaurant in New Holland, PA. Registration begins at 6:00 PM with an All You Can Eat Buffet Dinner beginning at 6:30 PM. The evening’s program will begin at 7:30 PM. 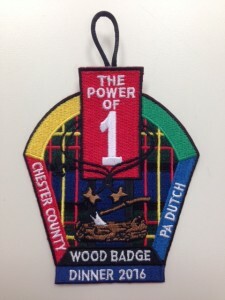 The Pennsylvania Dutch and Chester County Councils have a Wood Badge Scholarship fund. This fund is administered by the Pennsylvania Dutch Council; however, the funds will be available to adult leaders from either council. In addition, any funds not used will be made available to future courses. Any scouter needing access to the funds will complete a Wood Badge Scholarship request that will be approved by the Course Director and each Council’s Wood Badge Coordinator. Consider helping other Scouters attend and benefit from Wood Badge training by making a gift to the Wood Badge Scholarship Fund. Gifts of $20.00 or more will receive the commemorative Wood Badge Shoulder patch.